We hope you have been enjoying the series about low back pain and it’s causes and origins. Part 1 covered myofascial pain, part 2 covered facetogenic pain, and this week’s topic is the often misunderstood discogenic pain. I hope you find this series informative and helpful! Low back pain is an exceptionally common condition in which an estimated half to three-quarters of the adult population will experience at least one memorable episode of back pain per year and up to 1 in 10 will develop chronic back pain. Acute back pain, which resolves within weeks, is typically attributed to the soft connective tissues. Once pain goes beyond three months, it is considered chronic and the physiology of this pain can become quite complex. Chronic back pain is typically attributed to traumatic or degenerative conditions, and may include a variety of physiologic, psychological, and social influences. Most patients with chronic back pain will respond to conservative treatments as anti-inflammatory medications, physical therapies, and therapeutic injections become more widespread and better understood. Others won’t, and in some cases surgical options exist and have become more common due to the popularization of minimally invasive techniques. Myofascial pain is that which is attributable to a primarily muscular of ligamentous origin. Facetogenic pain is mediated by the facet joints of the spine. 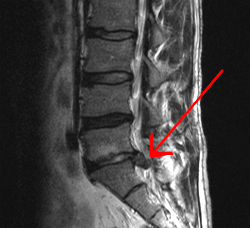 Discogenic pain emanates from the intervertebral discs. Discogenic pain typically causes centralized back pain that is often positional, worsening when sitting up or standing and improving with lying down. The discs themselves are innervated by sensory nerve fibers that are concentrated in the tough outer ring of the disc called the annulus. The discs degenerate over time and this includes cracking and tears in the annulus. Small tears will usually heal, but larger tears may not and these can become a persistent source of pain, particularly from movement and load on the discs. Compounding this is the production of chemical signals in the deteriorating discs that transmit pain signals through the nerves and tissues. These signals involved in the generation of discogenic pain have been extensively studied but remain poorly understood. We do know that at least some of these pain signals are produced by the inflammatory response associated with the degenerating discs, and this is the basis of steroid injections and anti-inflammatory medications as the mainstays of treatment for discogenic pain. Surgery for discogenic pain is controversial to say the least and has traditionally been avoided entirely or involved fusion procedures or artificial disk replacement to eliminate the pain-inducing motion of the abnormal disc segments. Current and future research is focused on disc regeneration therapies in lieu of surgery, with special attention paid to stem cell therapies and other anti-inflammatory disc injections to stimulate disc regeneration and healing. The verdict is still out on these treatments, however, and for the most part they remain experimental. With continued studies and the accumulation of data from laboratory and clinical trials, a clearer picture of effective and safe treatments will develop. Once again, I hope you find this 3-part series on low back pain helpful and informative. If you are experiencing any of these types of symptoms and need to see a spine specialist, please don’t hesitate to call our office at (214) 378-7200 for an appointment with me. Dr. Musacchio – I’m a delighted patient of Dr. Peloza, and I have a question. When will the new therapies for degenerative disc disease come to fruition? Or, in the meantime, besides “hitting the gym”,losing more weight, and the drug therapies, what else could I do? I’ve enjoyed the series – thank you! “Cathy, great question but a tough one to answer. Determining efficacy and safety of new therapies and technologies is a daunting task which requires extensive research and clinical trials. In the event that a therapy is proven to be safe and effective, the process of obtaining FDA approval and making it widely available is yet another enduring process. So, it is difficult to predict when and where new therapies will emerge although popular thought has turned to biologics and disc regeneration therapies such as stem cells and tissue-supporting proteins and nutrients. As a patient of Dr. Peloza’s, you are likely very aware of our individualized approach to patient care and there are options available and unique to each patient’s symptoms and pathologies. Thank you very much for the response!” – Dr. Musacchio, Jr.